Hundreds of city children packed the auditorium of Martin Luther King Jr. Elementary School on Wednesday afternoon as councilman William McKoy distributed a large number of toys for Christmas. One of those who packed the auditorium was Niya Stewart who brought two foster and three of her children to the annual toy giveaway that’s on its 12th year. “He’s doing something that’s helping our community and our children,” she said. All five of her children will go home with presents. 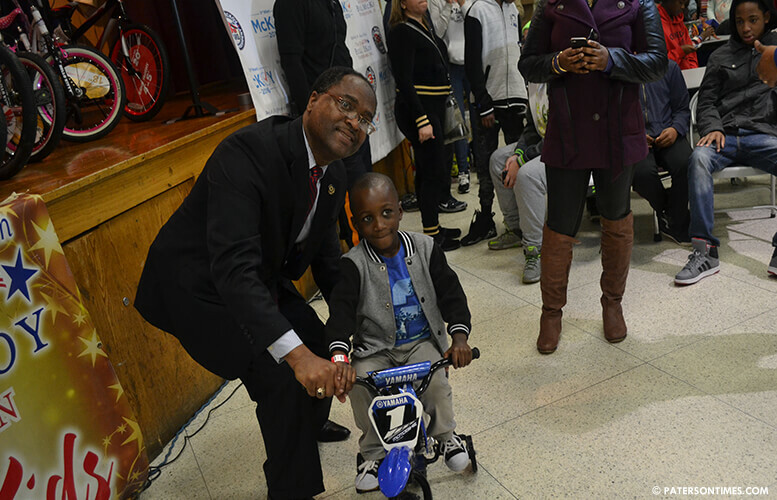 Councilman William McKoy with a boy who won a bicycle through the raffle. McKoy’s family emigrated to Paterson from the Caribbean nation in 1972, according to his family, when he was a teenager. McKoy had a large number of presents for every child who came out in the rainy afternoon. Some of those giveaways included “Star Wars: The Force Awakens” action figures, Lego SpongeBob, School Bus Ride-On, Play-Doh Diggin’ Rigs, and much more. Those were some of the presents that every child had an opportunity to pick from. The councilman also had a stage full of “Wow Gifts” that he raffled out. Those gifts included an Xbox, four laptops, 14 bicycles, a number of tricycles, and many other prized Christmas presents. Though an exact count was unavailable it is estimate the councilman had 1,000 different presents at the giveaway. The monetary value of the gifts is estimated to be $10,000 to $15,000. 341 children went home with presents. McKoy began giving out presents after he was first elected to the city council. He said he at first used his own money to purchase and give out the gifts, but then someone told him he ought to establish an organization for the purpose. The toys were purchased using money raised through that organization — the Bill McKoy Foundation, a nonprofit the councilman established specifically for the purpose. The organization also collects toys during its fundraiser. 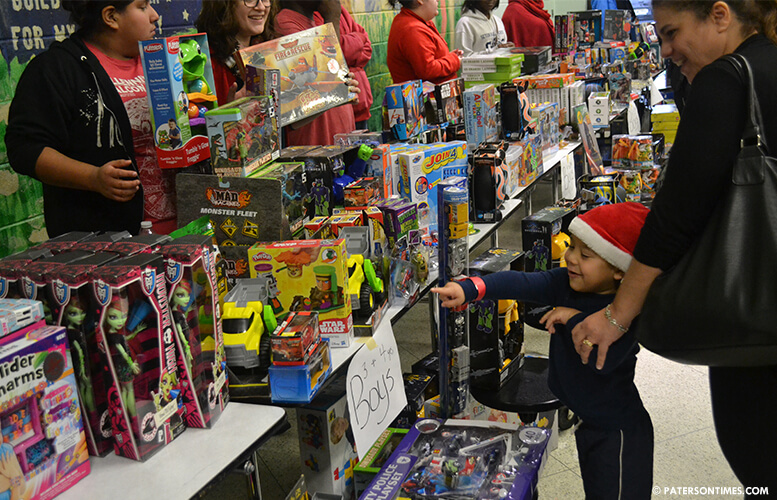 The toys given out were a mix of collected and purchased, said organizers. “There’s probably so many parents here that can’t afford gifts for their kids,” said Carl Brown who brought his three daughters to the giveaway. While his daughters were off to grab slices of pizza – served to everyone who came out for the event – Brown said some of the children would probably have nothing to open on Christmas morning without McKoy’s annual toy giveaway. Brown lives in the Near Eastside section. He said he supports the councilman and spoke highly of McKoy. Organizers circulated petitions to collect signatures for McKoy as he seeks his 5th term on the municipal council in May of next year. Attendees did not just come from the 3rd Ward. Many came from other parts of the city. A large number came from the city’s 1st Ward.